A semi-detached house in Permas Jaya, Johor costs a fraction of that in Singapore. ISKANDAR Regional Development Authority (Irda) anticipates the second phase of Iskandar Malaysia development from 2011 to 2015 to be more challenging than phase one which was from 2006 to 2010. Chief executive officer Ismail Ibrahim tells StarBizWeek that while the first phase was about planning and building foundations, the next level is about growth and expansion. He says the next three years to 2015 will be about leveraging on developments from phase one. “The challenge will always be there... in different forms. The question is whether we are able to anticipate it,” he says. He adds that risks are unavoidable in an undertaking the scale of Iskandar Malaysia, hence stakeholders need to do risk management. Located in the southern-most part of Johor, Iskandar Malaysia is the country's first economic growth corridor launched in 2006, spanning 2,217 sq km three times the size of Singapore. A five-year progress report on the economic region by Irda forecasts Iskandar Malaysia would need total investment of RM383bil (US$115.7 bil) over the next 20 years. It generated a total cumulative committed investments of RM84.56bil until the first quarter of this year. “The next move is to continue attracting more domestic and foreign investors through a systematic approach and strategy of engaging with them,” he says. Irda is looking at investments averaging between RM15bil and RM20bil yearly from 2011 to 2015, up from RM10bil-RM15bil targeted from 2006 to 2010. The tide seems to be turning in favour of the region. Singapore-based Jones Lang LaSalle head of residential project sales David Neubronner says interest in the region was limited and muted in its initial years but has changed dramatically of late. “Singaporean interest, until recently, has generally been muted and limited to a handful of developments like Leisure Farm and Horizon Hills. However, the situation has changed quite dramatically recently,” says Neubronner, in an email interview. Iskandar Malaysia is now spoken in the same breath as Johor Baru and has become synonymous with the city. No longer do developers say they have a project in Kota Tinggi or Johor Baru, or some other specific town. Tangibles like new highways and improved landscaping have helped. Other tangibles include the September launch of themepark Legoland and educational facilities in Educity. While Singapore has the means, it lacks the land. Johor has abundance of land, but lacks the means. Iskandar Malaysia is presented as a new territory with ample opportunities for all, particularly Singaporeans in terms of value, growth and possibly future retirement plans, Neubronner says. He says there are lots of push and pull factors to steer interest to Malaysia in general, and the Iskandar scheme, in particular. “The rapid price appreciation of Singapore properties over the past 30 months is one of them,” he adds. “With new price levels, Malaysian properties become relatively cheaper. For example, a new semi-detached house in Bukit Timah, Singapore costs S$5mil (RM12.4mil). A similar house in The Straits View Permas Jaya Johor, 10 minutes drive from CIQ Johor, is S$500,000 (RM1.24mil) or a fraction of what it costs in Singapore. “And that same house in Permas Jaya offers a view of Senoko Singapore (a power station),” quips Neubronner. While Iskandar beckons, on the other side of the causeway, the Singapore government has implemented a slew of anti-speculative measures to deter investors in Singapore from speculating in the Singapore property market, he says. From the global property perspective, property values in Malaysia and London have “depreciated” on the basis of the strong Singapore dollar. Supporting the strong interest for Malaysian property investment is a market well supported by robust fundamentals, including political stability, economic growth and a fast growing middle class which is driving demand in the overall market. Neubronner says interest subsidy schemes offered by Malaysian developers, which is not available in Singapore anymore, is another key attraction. In this scheme, an investor needs to put in as little as 10% cash downpayment and nothing thereafter until the development is completed, which may be three to four years down the road. “Should the property appreciate by 10% at completion, the investor would have doubled their investment, before outgoings,” says Neubronner. But the formula of affordable property prices and easy credit alone will not have worked if not for friendly government ties between the two countries,” says Neubronner. The guardians of Iskandar could not be more illustrious and the political weightage could not be more influential. Prime Minister Datuk Seri Najib Tun Razak, and the Johor menteri besar are keenly involved. Irda, the agency that regulates, plans, promotes and strategises Iskandar Malaysia's growth, reports directly to them. Goverment-linked company (GLC) Khazanah Nasional Bhd drives the corporate motor with managing director Tan Sri Azman Mokhtar having a seat on the Irda board. Other GLCs involved include Iskandar Investment Bhd (IIB) and the UEM group. There is a reason for such heavyweights. This is the first of several economic zones being promoted by the Government. So far, it has also been the most successful, despite its muted start. Former Prime Minister Tun Abdullah Ahmad Badawi launched the growth corridor in 2006, then known as Iskandar Regional Development. It attracted much Middle Eastern interest. These initial investors came with their riyals and dirhams to buy land with the aim to become master developers. The project then was very much government-driven. The scarcity of land for development in the Klang Valley and the proximity to Singapore prompted the private sector to invest in Johor. Today, some of the country's top developers have interest here. These include BRDB Developments Bhd, the Eastern & Oriental group, Mah Sing and SP Setia group. Their move down south has given credibility to the project, says Neubronner. Says a property lawyer promoting Malaysian properties to foreigners: “Malaysia was viewed as among the more progressive, moderate and modern Islamic states in the region. It was this factor which attracted the Middle Eastern investors to our shores. (But in the opening up of any region), you need people who actually come and stay and not just to buy land. And our closest neighbour is Singapore,” he says. A report from Jones Lang LaSalle in London may provide the clue why Singapore is important for Iskandar Malaysia's success. The report says Singapore has the world's highest concentration of wealthy people and is considered as “the Switzerland of Asia”. And all the wealth are just across the causeway. Singapore has more millionaires per capita of its five million population than anywhere else on the planet, reported The Telegraph. Although other countries have more total millionaires because of larger populations, the little red dot in South-East Asia has more as a percentage of its population. The catalyst to the strong buying interest from Singaporeans has been the warming of political ties between the two governments and their leaders, says Neubronner. Ties improved when Najib hosted his counterpart Lee Hsien Loong at an inter-governmental meeting in March. Both countries were looking for opportunities to expand beyond their borders. International Trade and Industry Minister Datuk Seri Mustapa Mohamed says the Singapore business community is looking to relocate or expand operations in Iskandar Malaysia. That meeting was quickly followed with Temasek Holdings (Pte) Ltd and Khazanah Nasional Bhd announcing they would jointly develop about RM30bil of projects in the south of Peninsular Malaysia and Singapore. The developments in Singapore will include hotels, apartments, offices and shops in two main areas of the city state while the Iskandar developments will have homes, retail space and “wellness-related offerings”. Singapore Business Federation did not respond to questions emailed to them. The Association of Small & Medium Enterprises in Singapore says it does not have information about Singapore's SME interests in Iskandar Malaysia. “We need the support of Singapore because it is a successful neighbour and has a well-established brand name. It is generally felt that if Singapore companies were to invest in Iskandar, it will be quite safe for others to follow,” he says. While government-to-government ties are important, other prerequisites are needed. These include good infrastructure in the form of roads and connectivity, services, amenities and aggressive marketing and promotional efforts from both private and public sector. “With each passing day, the challenge (seems) less daunting,” says Neubronner. Legoland Malaysia will be opening its doors Sept 15 to provide the leisure component. Over one million visitors are expected during its first year of operations. “We are expecting to have over 70% to 80% of the visitors from Malaysia and Singapore, with the rest are international visitors,” says Legoland Malaysia general manager Siegfried Boerst. The park's pre-opening promotional drive, which began in January, resulted in 35,000 annual passes sold online by the closing date on April 16, the highest ever recorded for the sale of pre-opening annual passes for any of the Legoland theme parks. Singaporeans make up the majority of foreign buyers who bought 40% of those passes. Malaysians bought the other 60%. Even without Legoland, Singaporeans were enjoying the beach and island resorts over in Johor over the years. Brian says he is drawn to the open space and serenity of Johor. He has bought a holiday home in Leisure Farm some years ago. EduCity provides the education framework. In the next five years, Iskandar is expected to have 10,000 students, nine universities and schools. Raffles University Iskandar vice-president (services) and registrar Gan Chin Huat says its American-curriculum school is targeting 1,000 students in 2017. Of the 3,000 students targeted for Raffles University Iskandar, half of them are expected to be Malaysians and the rest from around the region. On how it will attract students to Iskandar, Gan says Raffles Education Corp is a quality name in Asia Pacific and its graduates are well received by industries. Raffles will offer hostel facilities in the new campus at Iskandar and also shuttle students over, he says in an email interview. The Raffles education group has 32,000 students in the 38 Raffles Colleges in 35 cities in 14 countries. Of the three universities and 38 colleges in 14 countries, Gan says they only have one Raffles College of Higher Education in Singapore with the rest located elsewhere. In Malaysia, the group currently has one Raffles College in KL in addition to the Raffles University Iskandar and Raffles American School in JB. While Singaporean and Malaysians with PR status remain a prime target, and with the US and the eurozone the way they are, other Asian investors from Indonesia, South Korea, China and Vietnam are being keenly sought. The building blocks for the next chapter attracting investors are being put together today. But challenges remain. Semi-detached homes perched over the 1.2km Canal Waterways in Bayou Water Village. WINNING accolades seems to be second nature for property developer Mulpha International Bhd, which recently picked up an award at the 20th FIABCI Prix d’Excellence Awards for its Bayou Water Village development under the Best Residential (Low-Rise) category. The development is part of the company’s 1,765-acre Leisure Farm Resort in Gelang Patah, Johor and next to the Second Link Expressway to Singapore. Winning a FIABCI Prix d’Excellence Award is certainly great for the public image, but Mulpha deputy chief executive officer (property division) Ronn Yong is quick to point out it is also beneficial from a business sense. Yong says FIABCI award is a confidence booster and reaffirms Mulpha’s mission of establishing its brand name as a high-end eco-lifestyle developer that gives back to nature. He says the Bayou Water Village development is built and designed according to Singapore’s Construction Quality Assessment System (Conquas) to ensure that only homes of high quality and excellent workmanship are delivered to homeowners. “From a business sense, it is a testament to delivering Conquas standard finishes with passive green features. It’s also about getting recognition from the challenging property industry. “It is definitely a confidence booster, knowing that we are coming up with the right products – and that it is being well accepted by the market both locally and internationally. It also helps to reaffirm Mulpha’s mission of establishing its brand name as a high-end eco lifestyle developer that gives back to nature,” Yong tells StarBizWeek. The 22-acre Bayou Water Village development comprises 213 two-storey residential units, five bungalows, 46 semi-detached units and 162 courtyard terrace homes. The development has a distinct Malaysian village concept, with the houses built on stilts, fronting a waterway and built in small clusters at certain sections. It also features homes nestled within nine acres of park, 1.2km of canal waterways and garden ponds. The houses are linked by three bridges over the canal, with jogging paths, pocket parks, barbeque gardens and childern’s play area. The homes range from 1,777 sq ft to 2,203 sq ft and are priced around RM550,000. Residents are a mix of locals, Singaporeans and other expatriates. 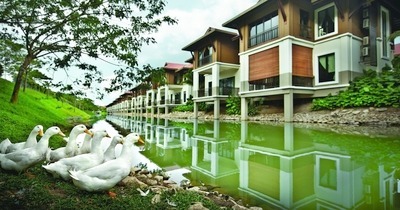 “The creative design adopts an eco-chic waterfront village living concept. The (development) planning takes into account site factors such as respecting the surrounding ecosystem and interacting with the inherent environment,” says Yong. According to him, prior to construction, Mulpha went to great lengths to ensure the impact on the surrounding ecosystem was minimal. Detailed, photo-documentation of the sites was done prior to construction, so that the company would know if any wildlife would be affected upon the project completion. “It (the development) definitely stands out from the rest, especially when we successfully transformed the existing drain reserve into a garden spine with 1.2km of sustainable canal waterways and walkways. “The newly carved canal becomes a natural habitat that meanders through the whole site, linked by a series of bridges to an island clubhouse with a cantilevered pool perching over the canal, making it a community hub,” Yong says. Yong says integrating its development with the surrounding nature also helps the company differentiate itself from the competition. “When we come to a piece of land that has a lot of green, we don’t want to ignore it and we chose to work with the surrounding. Another thing is that with our proximity to Singapore, we need to differentiate ourselves. According to Yong, the latest award for Bayou Water Village is the fourth FIABCI Prix d’Excellence Awards for Mulpha. It has also won three awards on the local front at the FIABCI Malaysia Property Awards. The awards are intended to recognise the world’s best developments. This year’s FIABCI Prix d’Excellence Awards, which was held in May at St Petersburg, Russia, crowned four Malaysian developments in total. The event saw winners from seven countries namely Hungary, India, Malaysia, Russia, Singapore, Taiwan and Turkey. There were over 60 projects from 16 countries that contested for this year’s international awards. “Naturally, we will continue to develop more international class products, which we believe will benefit our investors and residents in the long term. Moving forward, Yong says Mulpha will continue to focus on developing more projects within Leisure Farm. Firstly, Bayou Creek, known as Precinct 7 and consisting of 332 canal front bungalows and semi-detached houses, will be launched in four sub-phases over three years. This precinct is a continuation of our series of successful canal-front living homes. Yong says the first phase opened for sale recently, offering 96 units of semi-detached houses and bungalows at RM1.8mil and RM2.8mil respectively. On the prospects of the property market, Yong says the prevailing cautious market sentiment currently, coupled with the uncertain global economy, will pose challenges. “Nevertheless, we see many opportunities opening up in Iskandar Malaysia from this year onwards for Leisure Farm. This year represents the tipping point of Iskandar Malaysia with the commencement of some catalytic developments such as the Johor Premium Outlet, Newcastle Medicine University and Legoland in September. “The improved bilateral relationship with the Singapore has also seen interest in Iskandar Malaysia grow. We’re also optimistic because compared with Singapore, in terms of price per sq ft, we’re about one-fifth cheaper. So based on that, the Malaysian property market is still attractive,” says Yong. CALL them what you like leasebacks, buy-to-let, cash back, own-for-free developers have come up with creative plans to woo investors with guaranteed rental returns (GRRs) on yet-to-be-built properties. Developers would agree to pay buyers rentals ranging from 8% to 12% per annum or a proportion of the purchase price for a certain length of time. This kind of purchase, which has become increasingly common judging from the press advertisements, sounds enticing to investors who do not want the trouble of managing their own investments. You buy the property, and you get the rental returns thrown in. While GRRs could be very attractive, investors need to know that the scheme is not as simple as it seems, much like ads that appeal to our desire to lose weight quickly, get rich fast or strike the lottery. If a developer is offering GRRs, the buyer has no way of knowing whether that property is going to achieve the promise in the open market. The developer may not be able to get the guaranteed rent or the property may not be let out at all during the guaranteed period. Generally, GRRs are best for the laidback investor. Some people will value the “simplicity” of the deal. However there are issues that buyers have to be aware of and comfortable with before entering into such agreements. A typical mortgage lasts 20 years. If you have a guaranteed rental for just three years, what will happen for the next 17 years? You are left to sink or swim on your own. A typical table of returns will show potential buyers a surplus income. A potential investor has to take into account the cost of maintaining the property, the taxes that come with being a property owner, the cost of maintaining the mortgage and all other fees related to acquiring the property. Under most GRR schemes, you will need to buy a furniture package with the apartment and commit yourself to the management charges and sinking fund of the building, on top of the regulatory quit rent and assessment tax. These will often take a substantial bite out of any rental money left each month. GRRs are specifically aimed at selling units to investors, so you may see a situation of 500 apartments all going to the rental market rather than owner-occupiers at the end of the scheme. You will need to consider how many people will be chasing tenants at the end of the guarantee period and most particularly how many prospective tenants there are. In areas of high competition, landlords will have to reduce the rent to attract available tenants. Consequently, the market value of the properties will go down rather than up. If you decide to sell, you will also be limited to buyers who will also be mainly investors. Sellers will also find themselves competing with developers who are offering higher rental returns with new developments. Overpricing When supply is more than demand, developers always look for ways to avoid having to reduce prices. While GRRs may offer attractive secure returns, it will be a false economy in the long run if the buyer ends up overpaying for the property. A guarantee is only as good as the company who underwrites it. Even if the GRRs seem reasonable and are offered with honourable intentions, investors need to be sure that the developer would be able to sustain the returns if the rental or sales market were to take a turn for the worse. If developers were to default on the payments due to buyers, these buyers will likely default on their respective loan repayments, thereby setting off a chain of events with dire consequences. Quite sometime ago, we received an email from an observer who was at a developer's office. He narrated this incident where he witnessed an elderly Ah Pek who had just taken “vacant possession” of his investments, comprising four units of apartments with a GRR scheme. He was demanding that the developer “take back” the units and give him a full refund on the purchases. The Ah Pek had discovered that the four units he purchased under the developer's GRR scheme had depreciated in value by 25%. 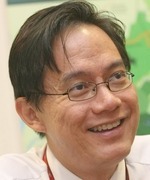 To rub salt to the wound, the developer had terminated the GRR scheme as allowed in their agreement, leaving the Ah Pek frustrated with his “failed” investment. The elderly Ah Pek wept in full view of all present at the developer's office! Did the “generous” developer give the Ah Pek any refund? Your guess is as good as mine. In another case reported in the local papers two years ago, a group of investors filed a legal suit to claim from the developer whom they alleged had breached their agreements. They were practically throwing good money after bad. Win or lose, lawyers collected their fees upfront. The rental market is volatile, depending on current competition and market conditions. People investing in these schemes are not just buying properties that they hope will increase in value in time, but also using “other people's” money (from rentals) to pay for the purchase. It is, however, a cyclical market, and one is subject to the laws of supply and demand as in any other sector of the economy. GRRs offered to investors should be checked carefully against the local market and competition. A simple survey within the location will give an investor a fair idea of the state of the local market. If market prices are lower than the proposed rent, incentives and discounts being offered to woo the buyers, then this are issues to be considered. If guarantees of rentals are higher than the existing market rate, then a rent decline after the end of the guarantee is likely. It is a classic case of caveat emptor rental guarantees can sometimes guarantee investors nothing but heartache. Our economic cycle goes through cyclical changes that response to economic and other happenings in, as well as, outside our country. Projected monetary returns that cannot be guaranteed (or self-guaranteed) are doubtful in nature. Had it been so profitable, don't you think that the developer, their shareholders and related companies would have snapped them up before being available in the market? Why don't they keep it for themselves? Guaranteed returns should be accompanied by documentary proof of a trust account nothing more nothing less. PROPERTY consultants say the lower price point compared with Singapore properties, which are eight to 10 times higher, and the proximity to Singapore are two of the main reasons why foreigners buy into Iskandar Malaysia’s property developments. Personal, telephone and email interviews with property consultants in Kuala Lumpur, Johor and Singapore say most of the foreigners who buy into Iskandar Malaysia are Singaporeans, which developers in Johor confirm. Singapore-based Jones Lang LaSalle head of residential project sales David Neubronner says the physical proximity to the city state is a huge attraction, when compared with buying properties in Kuala Lumpur city or Penang. A drive to Kuala Lumpur will take between four to five hours and to Penang island another three to four hours. “It is a case of picking at the low hanging fruits as there is the perception that the growth corridor, which is about an hour’s drive away, and relatively cheap to enter, is a new horizon with vast potential and opportunities. There is the perception that over time, values will multiply,” says Neubronner. They have heard how the pioneer investors in Horizon Hills and Leisure Farm, who made their investments five to six years ago, have reaped hefty profit and enjoyed price appreciation in the property. Johor-based KGV International Property Consultants (M) Sdn Bhd director Samuel Tan Wee Cheng says the yield factor is not a major criteria for them. Location matters a lot and properties located at Nusajaya with their contemporary designs have generated a lot of attention. The same goes for waterfront projects. “The higher cost of living in Singapore has resulted in some Singaporeans relocating to Johor. The common cultural and language platforms between the two countries have also played an important role,” says Tan. Among the Japanese, Malaysia, which is free from natural disasters like earthquakes and typhoons, is a great attraction. Tropical Resort Lifestyle (MM2H) Sdn Bhd managing director Ishihara Shotaro says Japanese interest has been particularly good after the March 2011 earthquake and tsunami, especially for those below 40 years old as Iskandar Malaysia has a 10- to 15-year timeframe to be developed. Shotaro promotes Malaysian properties among the Japanese and is also involved in the Malaysia My Second Home (MM2H) programme. Most of the major highways are operational. Among them are the Southern Link, Senai-Desaru Highway, EDL and Western Coastal Highway. There are also many interchanges and flyovers constructed to ease traffic flow within Johor Baru. Among them are those at Jalan Yahya Awal, at Jalan Abu Bakar, at Ulu Tiram town and soon at the Senai Airport junction. All these work towards improving connectivity within Iskandar. These new highways open new frontiers into regions which were not popular – or accessible – in the past. “Since these highways and expressways have become operational, we noticed that property prices have shot up. Examples of these places are those near Nusajaya and along the Southern Link,” says Tan. At the state government level, he says the local authorities have also worked to improve relationships. “There must also be an atmosphere of welcome by the authorities which means there is a need for consistent and friendly foreign property ownership policies,” says Tan. The marketing efforts and promotional campaigns by the stake holders (developers who are offering their projects there as well as those involved in promoting the growth corridor) have been rather effective with more reputable developers entering Johor’s property development sector. Nevertheless, there are still concerns and perceptions which are also difficult to shake off. Among the main concerns is security followed by connectivity. Other important factors are proximity and availability of good and hygienic food and beverage outlets and other amenities. Security has always been an issue with Johor and despite the assurances by the government at federal level that overall security has improved for the country, that concern remains. Other concerns by investors are the quality of the workmanship of their purchases as most of these projects are purchased off plan. They are also concerned about delivery. “With so much land and construction, demand may not meet supply,” says Neubronner. “Potential for capital growth may also be constrained,” he says. These, he says, are the negative issues. But while there are challenges, he is quick to add the challenges facing the Iskandar scheme do not seem as daunting as before. “There seems to be more confidence on the delivery of the promise,” he says, adding that these issues can be overcome with better public relations with the market, which the Malaysian authorities at various levels are working hard on. The entry of more reputable players into the fold has also boosted the confidence of investors, both local and foreign. Some of the big names in Malaysia’s property development who have interest there include Bandaraya Developments Bhd, which is known for its KLCC project The Troika, Cap Square and One Menerung in Bangsar, Kuala Lumpur and the SP Setia Group. The latest reputable developer to enter the Iskandar scheme is niche lifestyle developer Eastern & Oriental group wich is known for its Penang’s Tanjung Sri Pinang. “They have some success with the Japanese in places like Horizon Hills. But the MM2H scheme has a lot of work ahead,” he says. Singaporean and Japanese investors are generally comfortable with properties priced at about RM1mil or under S$500,000 – what they term “bite size” – between 600 sq ft and 1,000 sq ft. Investors prefer to buy multiple compact units in a few developments rather than to buy a single luxury apartment in the capital. He says while the Iskandar scheme is quickly soaking up buying interest from Singaporeans, other locations of interest to them include London, Melbourne, Sydney and Kuala Lumpur. ISKANDAR Regional Development Authority (Irda) CEO Ismail Ibrahim says Iskandar Malaysia is “blessed with the recent interest from Singapore” and that efforts to attract investments from the city will be intensified. This will especially be in high value industries such as high-tech and aerospace industries looking for expansion opportunities. One of the efforts currently pursued is setting up of a Singapore Industrial/SME Park in Iskandar Malaysia, he said in an email interview. Iskandar’s focus will continue to be on manufacturing while special focus will be given to creative, tourism, oil and gas and education sectors. Ismail added that Irda is also working closely with relevant associations and government agencies of Singapore such as its Educational Development Board, Spring, an agency under the Ministry of Trade and Industry responsible for helping Singapore enterprises grow and Semiconductor Equipment and Materials International, to name a few. Interest in Iskandar has increased considerably after top level government initiatives to jointly improve transport links and go into property joint ventures earlier this year. He says the relationship with Singapore can be strengthened further in growth sectors such as food processing, engineering and technology with the economic corridor providing infrastructure which will be cost advantageous for Singapore’s manufacturing industry. He says there is a need to develop a vibrant Iskandar-Singapore economic cluster. He says with “the looming economic uncertainty”, the most challenging part of developing Iskandar Malaysia has been getting various stakeholders to buy-in into the project during this second phase of development of the economic corridor which runs from 2011 to 2015. The first phase is from 2006 to 2010. Iskandar Malaysia, located in southern Johor is three times the size of Singapore. “I believe many can now see for themselves that Iskandar Malaysia is truly taking shape and bringing in benefits (to those who have earlier invested). “Additionally, with the full backing of the federal and state government, we are able to offer attractive incentive packages to potential investors. We are consistent in our marketing approach by looking at quality long-term investments in focus sectors and countries. Our strategies may vary depending on the dynamics of the current and future of the world economy,” says Ismail. “We have to broaden foreign and domestic investor base,” he said. He said although investments to date have surpassed early targets, attracting further investments from a wider range of foreign and domestic investors, particularly in priority sectors is necessary in order to sustain the momentum of growth and progress generated in the first phase. Property investors should know exactly where the projects are. EARLY this week, an article from wire service Reuters highlighted the perils of buying properties in an unfamiliar country. The article, datelined London, was about British developers and house builders promoting their projects in Asia as a result of strict lending guidelines drying up demand among Britons. StarBizWeek has also featured quite a number of articles about the British property market since 2009. Like stocks, bonds and other asset classes, property is another form of investment. While some may prefer to invest locally, others may invest abroad. But whether it is Britain, Australia, Singapore or Malaysia, developers anywhere work on the same principle and that is the need to sell in order to generate revenue, in both good and bad times. The world, with the exception of Asia (for now), is going through difficult times and this is expected to last quite a while. There is no end in sight for the eurozone crisis for many months to come, at least. That is why developers and house builders are promoting and marketing their projects in Hong Kong, Singapore and Malaysia more aggressively than before. Kuala Lumpur is a relatively new market for them as their normal destinations prior to 2009 have been Hong Kong and Singapore. When it comes to overseas property investments, the people in Hong Kong and Singapore have been there before us. But despite that, buyers from the former British colony have discovered that they have bought into projects based on misrepresentation. Another bought into a project that was located on Kensington High Street. The brochure alluded to the proximity of the High Street Kensington underground station. Some of these projects could well have been promoted here. In both these cases, there would be non-issues had the investors flown to London to see the actual site for themselves, check out the accessibility and the stations that may or may not be there. In the case of 375 Kensington High Street, on the map that came with the beautifully printed and obviously expensive brochure, the nearest tube station seems to be Olympia. But while Olympia is along the tube line, the train only stops there during public holidays, weekends and when there is an event at the exhibition hall which is located nearby. The train does not stop at Olympia during a weekday. One will not know that based on the information provided by the map alone. Secondly, to allude to the project being near High Street Kensington may be a bit of a stretch because the two nearest tube stations are West Kensington and Hammerstein, according to a source who used to live there. When 375 Kensington High Street was marketed in Kuala Lumpur, a thick glossy publication was given to potential investors. Kensington Street is a long road and on which end the property is sited is important. The local equivalent would be Jalan Ampang, which begins from Lebuh Ampang, passes the KLCC to Ampang Point to the deeper corners of Ampang. Some of Malaysia's most prestigious properties are located there and less prestigious ones as well with the KLCC as the central point of reference just as High Street Kensington tube station being the point of reference. If one has the inclination to buy into a project that runs into hundreds of thousands of ringgit or RM1mil or more, it seems only logical to check out the area before signing on the dotted line. That holiday, which costs a fraction of the investment, will give clarity to the investment, and peace of mind. While there, one may also request to see other properties by the same developer. Besides misrepresentation, it has been brought to our attention that some projects may not yet have got the necessary financing. British banks will only lend to developers after a certain portion of sales have been formalised. Some projects have been marketed in Asia with the hope and aim to achieve that sales target. Lack of financing may lead to delays. Some projects are promoted as having yield of between 5% and 6%. According to an agent, well located properties have yield of between 3% and 4%. The further away, the higher the yield. Properties in Kajang, for example, would be cheaper than those in Petaling Jaya and the yield from that Kajang house would be higher (annual rental/price). This does not mean London is not a good property investment destination. On the contrary, the EPF have bought into some landmark buildings there. It would not be fair, therefore, to tar with the same brush all properties promoted here. Indeed, some exceptional properties have arrived on Asian shores. But like companies that do due diligence before investing, individuals too must do likewise. Whether it is Melbourne, Singapore or London, or even a project here, wouldn't checking out the site be the first thing to do? Deputy news editor Thean Lee Cheng suggests it is time for some Malaysian investors to take a working holiday in Britain, if they have not done so already. 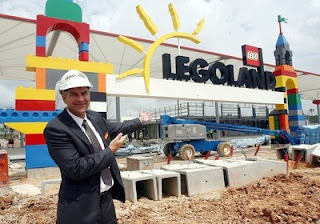 Nice entrance: Legoland Malaysia general manager Siegfried Boerst showing The Beginning – the main entrance to Legoland Malaysia Theme Park in Nusajaya, Iskandar Malaysia. ALTHOUGH Iskandar Malaysia has been having a pretty good run the last year or so, there are areas that need to be looked into if the Government is serious about promoting the growth corridor, investors, real estate agents on both sides of the causeway and people familiar with the project say. A foreign investor who declined to be named says he has read about government-linked companies (GLCs) flip-flopping and he personally experienced it when he took an interest in Imperia, a condominium project to be developed by UEM Land. “The GLCs need to improve their marketing skills and be more focused on their planning and when dealing with customers,” he says. Most investors and property consultants worth their salt would rather see past promises become a reality before they decide to invest in any future planned projects. This investor registered his interest in the condominium project Imperia at the end of 2010. He was given a layout and the price of the unit and was told the project will be officially launched early 2011. It was launched at the end of 2011 and was told the price of the unit has increased by 20% and the layout has changed. This investor says that left a poor impression of the developer. “I don’t think the private sector will do something like this,” he says. “Right now, I only see the highways. The education component, or Educity, is coming along well. As for the others, I have yet to see them so I am looking forward to the later part of this year when Legoland Malaysia is unveiled,” he says. Another investor says the size of Iskandar Malaysia is considerable and thus far, the Government has talked about so many things. There is Medini, the education component with various participation from universities and other educational institutions, Nusajaya and the different zones. “Can so many things take off on time? I am aware that the project has a long gestation period of between 10 to 15 years. I am also aware that investment is a risk and the future is uncertain. So, as an investor, it is natural that I would want to mitigate risks. “If it is a risk as a result of contagion effect from Europe and the US, that is not within the control of the people who are managing Iskandar. But if it is a risk as a result of poor management or changes in plans, then it is something that is within the control of companies set up to manage this economic corridor,” he says. He reiterates that he is able to digest and comprehend a small project like KL Sentral but Iskandar is a lot bigger and the risks of failure due to poor management will also be greater. Another Singapore realtor residing at Sentosa cove has invested in Iskandar Malaysia and comes across as more hopeful. She says she read about the Iskandar scheme and decided to purchase a semi-detached house in a gated and protected community called Straits Views Residence about six months ago at Permas Jaya in Johor. The project is located 10 minutes away from Singapore along the main route connecting Johor Baru City Centre to Pasir Gudang (Coastal Highway). Straits Views Residences is developed by BRDB’s wholly-owned subsidiary Permas Jaya Sdn Bhd. “It can be an investment or a weekend home,” she says. She says her main concern is the ringgit, hoping that it will not go lower and that the crime rate in Johor can be kept to a minimum. On her outlook for the Iskandar region, she says the nearest country is Singapore, which is doing well. “I see that this will spring over to Iskandar,” she says. The following are snippers from Klang Valley developers who have projects in Iskandar Malaysia. At the end of the day, Singaporeans and people in general, will want a place to call home. At the basic level they want security, quality education, medical attention, sports and recreation, retail, services and conveniences, and opportunities for career and enterprise. You will find all these essential elements in one place, Iskandar Malaysia, without having to pay premium prices of urban locations. We are offering more than just beautiful homes, we will provide a living environment that promotes total wellness and inspires the pursuit of well-being, The project is positioned as a wellness destination within this region and will cater to an international crowd. The masterplan for the Medini Integrated Wellness Capital is in the final stages of submission. The 210-acre project, with a gross development of RM3bil, is expected to help the niche developer carved a name for itself in the wellness industry targeted at the super rich. The idea was mooted by government-linked corporation (GLC) Khazanah Nasional Bhd. The group has projects totalling 4,590 acres in Johor. About 26,000 of 40,000 landed homes and condominiums have been built so far. We have 20% of non-Malaysian buyers for our link houses and 30% for our high-end homes. This is according to the quota set by the local Johor government; 95% of these non-Malaysian buyers are Singaporeans. About 30% of these non-Malaysian buyers buy for investments and 70% buy to stay. Other nationalities include Japanese, Germans, Italians and Indonesians. Our reputation and development concept places an importance on the environment and security. The provision of adequate amenities and gardens or parks appeal to our buyers. A lot of effort has also been put in to address the issue of safety, which is a major concern for Singaporeans. Irda has already set up a task force that includes regular police patrols and fast respond squads on top of auxiliary police personnel being trained to supplement the existing police force. This shows the serious commitment of the state government in allaying fears of Iskandar Malaysia not being safe. There is great potential for capital appreciation of properties with so much happening in Iskandar Malaysia, from tourism attractions to education and medical facilities. Improved infrastructures like Johor Baru Eastern Dispersal Link, Coastal Highway, Senai Desaru Expressway has made travelling in Iskandar Malaysia a breeze. The future joint development of a Rapid Transit Link between Iskandar Malaysia and Singapore to enhance connectivity between the two countries will definitely be a push factor. There is a need for international-level service standards and facilities. Setia's total gross development value (GDV) of properties already build in Johor is RM15bil and total GDV of properties not yet built but will be built is RM9bil. We have been in Johor Baru since year 2000 and currently have four mixed townships as well as an industrial project. Remaining gross development value in Johor is RM1.2bil or approximately 8% of the group's remaining GDV and unbilled sales is RM16.27bil. Our townships are in Skudai, Tebrau and Plentong, while the group has a new industrial project of 206 acres Mah Sing iParc just 1km from the Port of Tanjung Pelepas (Malaysia's second busiest port) and 23km to Jurong industrial estate. Mah Sing iParc will see its maiden launch this year and is expected to see strong interest from Singaporean buyers as prices in Jurong are about 6 times more, plus Jurong is leasehold (Mah Sing iParc is freehold), and is only 8km from the second bridge to Singapore. Currently, we have about 10% foreign buyers with the bulk of them coming from Singapore. 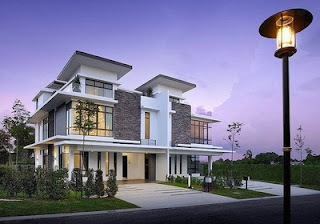 Our Johor townships, being mainly landed residential homes, have attracted mostly Malaysians who use it for own stay, although some of them work in Singapore and travel daily. UEM Land Holdings Bhd does not limit itself to Singaporean property buyers and investors when it comes to its development projects in Nusajaya. 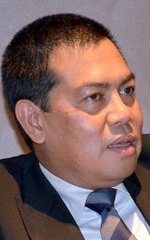 Managing director and chief executive officer Datuk Wan Abdullah Wan Ibrahim (pic) says although Singaporeans always remain important to the company, it is open to all other nationalities. “In fact, Singaporeans are among the 50 nationalities who are buyers for our residential properties in Nusajaya,’’ he tells StarBizWeek. Wan Abdullah says Nusajaya can be considered as the “United Nations of Johor” due to the large presence of foreign property buyers in the development zone. Nusajaya is one of the five flagship development zones in Iskandar Malaysia – others are the JB City Centre, Eastern Gate Development Zone, Western Gate Development Zone and Senai-Kulai. UEM Land is the master developer of the 9,308ha Nusajaya, the key driver of Iskandar Malaysia. The company has four ongoing projects – East Ledang, Nusa Idaman, Puteri Harbour and Nusa Bayu while Horizon Hills is a joint venture with Gamuda Land Bhd. “We, like any other Malaysian developers, welcome buyers and investors from all over the world and we are more than glad to serve them,’’ he says. Wan Abdullah says it is only logical that Singaporeans make up a large number of foreign property buyers in Johor Baru due to its close proximity with the republic. He says Singaporeans have been buying residential properties in Johor Baru dating from the late-1970s till today due to a large difference in pricing of properties in the republic and Johor. Wan Abdullah says the recent opening of the property gallery in the republic demonstrates its commitment to better serve the company’s current prospective customers and investors regardless of their nationalities. He says the gallery showcases its ongoing projects in Iskandar Malaysia’s Nusajaya and Kuala Lumpur and the proximity provided the opportunity for the company to be more engaging with its Singaporean buyers. “We choose Heritage Place as it is located within one of Singapore’s renowned business districts and a large number of foreign tourists visit the area,’’ says Wan Abdullah. He says prior to the opening of the gallery, the company regularly organised trips for Singaporeans to Nusajaya on weekends regularly to view the projects and it would continue to do so. On the portfolio of its foreign property buyers, Wan Abdullah says most of them are Singaporeans and other nationalities with businesses in Johor Baru. “The other category is Singaporeans who lived in the Housing Development Board flats here and bought landed houses in Nusajaya and come here regularly. 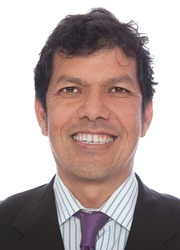 This year will be the tipping point for Iskandar Malaysia, says Iskandar Regional Development Authority (Irda) chief executive officer Ismail Ibrahim (pic) in an email interview. From the time the project was launched by former premier Tun Abdullah Ahmad Badawi to March this year, the growth corridor had a total cumulative committed investments of RM87.56bil versus the targeted amount of RM47bil needed for its first phase (2006-2010). 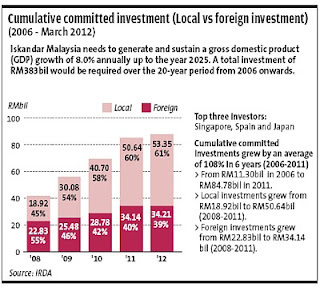 Of that total, 61% are from domestic investment (RM53.3bil) and 39% are foreign investment (RM34.21bil). A total of 43% has been spent on the ground for projects and infrastructure. Many catalytic development and infrastructure projects would be completed and operational. The focus will also be on the creative, tourism, oil and gas and education sectors. SBW: How has the eurozone problem affected Iskandar? Ismail: We have not seen any drop in investment from eurozone countries, which include Spain, so far. Rather, we see the current eurozone crisis as an opportunity as the unstable situation there may spur companies to look at better places to invest. How much of Spanish investments are already realised or invested here? 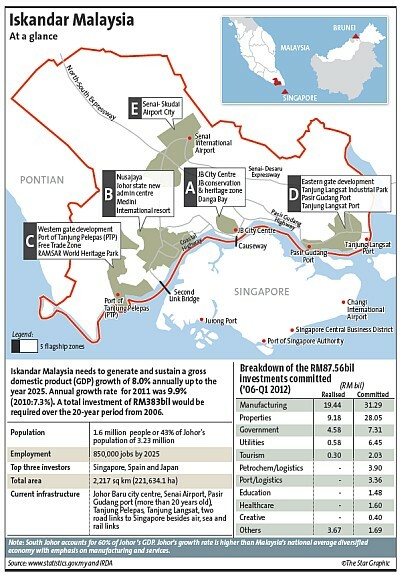 Total investments in the region of RM5bil. In the course of trying to attract investments, what do foreign investors want? I think the issue of crime in Johor is one of perception rather than fact, but that doesn’t mean that we can be idle. Irda is constantly working with the federal and state governments, the police and other stakeholders to improve security. In fact, 10 of the 32 Quality Living Projects announced by Prime Minister Datuk Seri Najib Tun Razak at the launch of the Corridor & City Labs Open Day a few months ago concerned security issues. This includes setting up an integrated CCTV surveillance system of 1,500 CCTVs and 190 community police posts to be set up by 2020. The 9,000-strong police force in Johor would be augmented with a 900-strong battalion of auxiliary police. We’ve also increased the number of patrol cars, mobile police stations and CCTVs, and we’ve set up a special task force and hotline for investors to report security issues to the authorities. All of these have had a positive effect: the Johor 2011 crime index has fallen by 24% and street crime by 42% compared to 2010. There’s of course still a lot of work to be done but we’re determined to change perceptions over time. The most challenging part was getting the buy-in from our various stakeholders. While this is a continuous process, I believe many already see for themselves that Iskandar Malaysia is truly taking shape. With the looming economic uncertainty, we will remain competitive. Our strategies may vary depending on the dynamics of the current and future of the world economy but we are consistent in our marketing approach. We are blessed with recent interest from Singapore and efforts of attracting investments from Singapore especially in high value industries such as high-tech and aerospace industries looking for expansion opportunities will be intensified. One of the efforts currently pursued is setting up of a Singapore Industrial/SME Park in Iskandar Malaysia. What does the future hold considering the global situation? While investments to date have surpassed early targets, attracting further investments from a wider range of foreign and domestic investors, particularly in priority sectors, is necessary. We are seeing a shift from the West to the East and are thus broadening the investor base by targeting Asian sources such as Singapore, China, Japan, India and South Korea. The investors sought should have long-term investment horizon. What is the latest development on transporation? FIABCI MALAYSIA is urging local property developers to “raise the bar” in order to remain competitive at the annual FIABCI Prix d’Excellence Awards, which comprises the best of the best from around the world. “The Malaysian real estate projects are some of the world’s best in the true sense. (However), the competition will get tougher each year as more and more countries enter the competition with their own national winners,” FIABCI Malaysia president Yeow Thit Sang said recently at an appreciation dinner for Malaysian developers that were honoured at this year’s FIABCI Prix d’Excellence Awards. Yeow however commended the Malaysian companies that were recognised at this year’s Prix d’Excellence Awards. “There is total transparency and independence in the judging process. None of the 47 judges knew who was marking which project. There was no comparison of opinion between any of them. All the marks were given independently,” he says. FIABCI Malaysia is the organiser of the annual Malaysia Property Awards (MPA), which is considered the “Oscars” of the property industry. Over the years, there has been an increasing emphasis on the environment and participants at the MPA have to take this into consideration. “The impact a particular project has on the environment currently accounts for between 20% and 25% of the judging criteria,” says Yeow. He also says the standard of judging for the MPA has increased over the years. “It comprises a four-tier process,” says Yeow, adding that the judges comprise past presidents of FIABCI Malaysia. “We also have a public auditor who collates all the marks,” he says. Winners of the MPA in their relevant categories will go on to represent Malaysia the following year at the FIABCI International Prix d’Excellence, an annual competition that honours the world’s best property projects. This year’s FIABCI Prix d’Excellence Awards, which was held in May at St. Petersburg, Russia, crowned four Malaysian developments in total, namely UEM Land Holding Bhd (for the Master Plan category), Mulpha International Bhd (Residential Low Rise) category, SP Setia Bhd (Specialised Project/Purpose-Built category and Sunway City (Ipoh) Sdn Bhd (Resort category). Established in 1992, this year’s MPA will be held in November. Separately, Yeow says he is optimistic about the outlook of the local property market for this year, adding however that things can turn for the worse should the global economic situation deteriorates. “The economies of the world have a great influence on the local market. If Europe and the United States are affected – because they are buying from us, it will affect us. Eventually, our products cannot sell and there will be unemployment. Signing off: Ahmad Fuad (second right) launching Platinum Sentral. The Kuala Lumpur City Hall (DBKL) is planning a incentive scheme to reward developers to design and construct green and sustainable buildings. 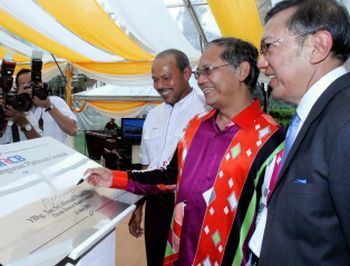 Mayor Tan Sri Ahmad Fuad Ismail said DBKL was still in talks with the Federal Territories and Urban Wellbeing Ministry to implement the scheme to recognise and reward developers who construct buildings that could conserve energy and water, provide a healthier indoor environment, better connectivity to public transport as well as adopt recycling and green programmes. Ahmad Fuad said the incentives could be in the form of reduction in fees paid to DBKL. “We are still developing a mechanism for the scheme. Reduction in development charges and assessment fees are just some of the incentives that can be offered to developers and building owners. “If developers can prove that their projects are green and sustainable, I think we should to give them some recognition,” he said after launching the Platinum Sentral building by the Malaysian Resources Corporation Bhd (MRCB) in KL Sentral. Platinum Sentral is the first Platinum-rated building in Malaysia and Green Building Index (GBI) certified. “We are happy to note that MRCB is spearheading green building development in KL. “DBKL has made it compulsory for all new developments in the city to be in compliance with GBI. “This is to ensure that all projects will not only be sustainable but are also people-friendly in terms of design and usability,” said Ahmad Fuad. KUALA LUMPUR: UEM Land Holdings Bhd recorded higher profit before tax of RM54.3 million for the first quarter ended March 31 2012 from RM17.6 million in the preceding year corresponding quarter. Revenue increase to RM303.7 million from RM187.6 million previously. While the property market was expected to remain cautious in the short term, given the prevailing lending environment, UEM Land was confident of its prospects in the current financial year.